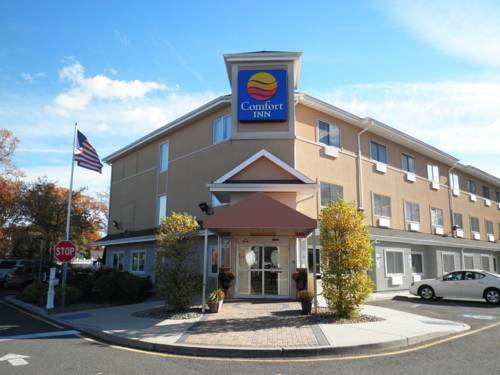 Behind every great day is a great night at the Comfort Inn hotel in Toms River, NJ near the Jersey Shore Marina. Nearby destinations include Island Beach State Park Marina, Ortley Beach, Casino Pier, Toms River Country Club and Ocean County College. Six Flags Great Adventure and Pine Belt Arena are also close. Enjoy amenities like free hot breakfast, free WiFi, indoor heated pool and a fitness center. Rooms come equipped with a flat-screen TV, refrigerator, hair dryer, iron and ironing board. Also, earn rewards including free nights and gift cards with our Choice Privileges Rewards program. Must be 21 years or older to reserve. ~30 miles from Toms River. ~42 miles from Toms River. ~54 miles from Toms River. After years of darkness, it was turned back on Oct. 24, 2015. It's perched atop an Art Deco tower, which stands where Thomas Edison once had a workshop. A small museum next door is packed with Edison inventions. ~44 miles from Toms River.